Tk. 10 account holders received loan in a spot loan distribution program in Jashore under Bangladesh Bank Refinancing Scheme. Financial Inclusion Department of Bangladesh Bank organised the programme with the assistance of BRAC Bank Limited. At the conference, BRAC Bank along with 20 banks in Jashore, through their 35 branches, distributed Tk 50 lac among the 100 account holders. This programme was organised with a view to bringing the people who live below the poverty line including marginalised and landless farmers into mainstream economy and invigorating Tk 10 account initiative. The commercial banks in Jashore, which are under agreement with Bangladesh Bank for refinancing scheme for Tk 10 account holders for financial inclusion of the marginalised/landless farmers, victims of natural disaster and small businessmen, participated in the program held at BRAC Learning Center in Jashore on Sunday (August 12). Md. Abul Bashar, General Manager, Financial Inclusion Department, Bangladesh Bank, was present as the chief guest. Syed Abdul Momen, Head of SME Banking, BRAC Bank; Mohammad Amir Hossain, General Manager, Sonali Bank, Khulna Division; Nazrul Islam, Head of Small Business, BRAC Bank; and other senior officials of the participating banks were present at the conference. 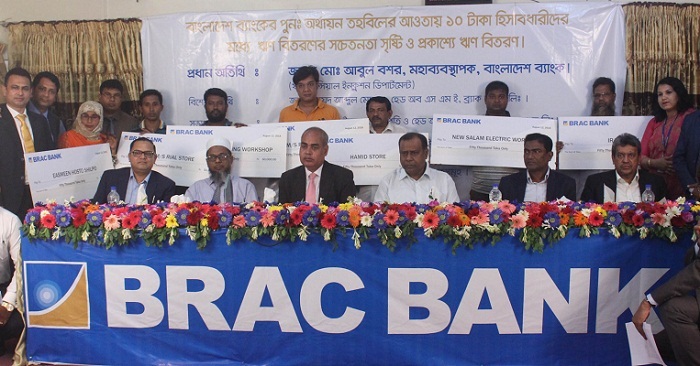 In the programme, BRAC Bank handed over loan Tk 50,000 to each Tk 10 account holders-- Iran Metal, Hamid Store, M/s Ripon Welding Workshop, New Salam Electric Workshop, M/s Rial Store, M/s Payel Traders and Easmeen Hosto Shilpo.